Four real Shamrocks (3-leaf clovers) enclosed in your choice of a white or ivory satin and organza ring pillow. Each leaf is preserved and clear-laminated to prevent breakage. 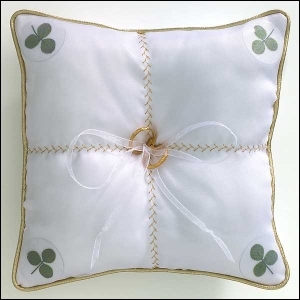 Pillow is 8" x 8" and adorned with your choice of gold, silver, white or ivory rope border and stitching. Comes with a personalized enclosure card with bride and groom's name and wedding date. Gift boxed. Hand-made to order, please allow 2 weeks for delivery.